The Deuce Brand watch comes in two styles, G2 a flatter band and the original which is more rounded. I chose the G2 with the flatter band and it really contours my wrist nicely. 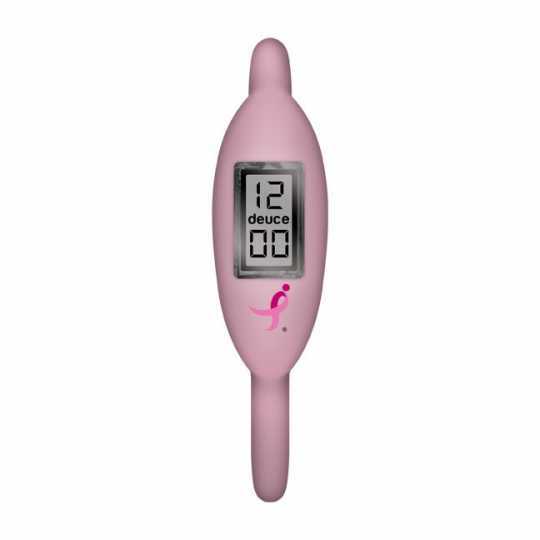 The screen is digital and easy to read and has an optional date/time setting. I am not very sport minded, but if I was this watch would be a perfect choice! Giveaway will end on June 2, 2011 at 11:59 pm EST. Open to US and Canada only. Please make sure your email address is public on your profile or leave with your comments so I can contact you should you win. ***When entering a giveaway, you MUST complete the mandatory entry requirements FIRST before completing your optional entries. If you do not successfully complete the mandatory entry or leave a valid email address, then you will be disqualified from the contest. *** The winner will be chosen by random.org and announced here as well as emailed and will have 48 hours to respond or a new winner will be chosen. This review and giveaway is in no way associated with Facebook, Twitter, or any other entity unless otherwise specified. I received no monetary compensation for this review but was supplied this product free of charge for evaluation purposes; however, all opinions are still 100% my own.